A Razor That Shaves Chocolate! What is better than chocolate? Nothing! Unless it’s chocolate on chocolate. 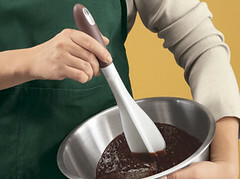 Decorating a chocolate cake with chocolate ribbons, cupcakes with chocolate shavings, or just making it faster to melt chocolate to make that wonderful ganache just got easier and cheaper with this handy kitchen gadget from Crate & Barrel. We all know how the microplaners have made our meal prep easier and this shaver finely slices and shaves not only chocolate, but can be used on nuts, soft cheeses, and butter! Comes with a blade guard and is dishwasher safe. The Microplane Chocolate Shaver, reg. 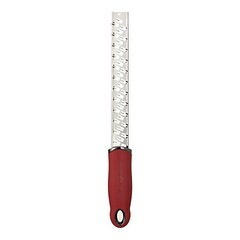 $14.95 on sale for $7.50 at Crate & Barrel is limited in quanties–so order now. Crate & Barrel Winter Sale going on now! Any candidate of Gordon Ramsey’s “Master Chef,” loves the new innovative kitchen gadgets that make our dishes looking professional with less effort. 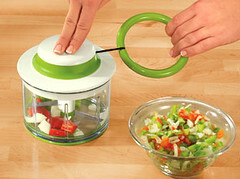 All those aspirants will love this new gadget MarkdownMom found in the new Chefs catalog. With improvements on beaters for our favorite KitchenAid mixers that scrape the bowl while mixing the ingredients, add this latest Whisk-A- Bowl attachment from Pourfect. Working 3 times faster than a regular whisk, this beater with its’ coiled wires lift and blend the ingredients, adding air to every rotation. Lighter soufflés, creamier and higher meringues, and wait to you see what it does to whipped cream! Applications of this tool are only limited by your imagination. 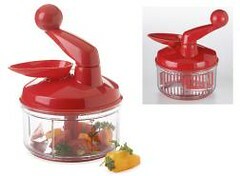 At Chefs™ $42.00-$46.00 depending on your KitchenAid model. Free Shipping on Purchases of $75 or more at Chefs, use coupon code: BW1EM6005. 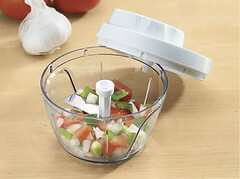 Check out KitchenAids new pasta press attachment, mamma mia! No, we are not talking about devotees of the 1956 sci-fi cult movie Invasion Of The Body Snatchers. What we are talking about is one of the new genre of hot kitchen gadgets. On Monday, March 15, 2010 GMA host Becky Worley revealed some of the new items from the 2010 International Homes and Housewares Show. 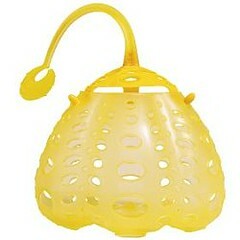 One new item that MarkdownMom found interesting was the FoodPod™ by Fusionbrands® . This is one of those new silicone heat resistant products that can make cooking medium size and larger items fast and safer. Boiling eggs poses a problem since once you get the boiling water going for eggs, using a large spoon and dropping them into the water, one by one, inevitably results in cracking one or more eggs that spews its’ albumin into the water. The FoodPod is a pouch with holes that allows you to boil, blanch, steam and drain in one easy operation many items such as shrimp, small potatoes, eggs, cauliflower and broccoli florets plus it has a handle that also clips onto the pan or lid top for easy retrieval. It must be noted that smaller items like frozen mixed vegetables can slip through the holes. At Amazon, $14.50. Become one of the Pod People, Handy, Safe, and Efficient! T Day Minus 8 and Counting! Thanksgiving is not far off, and most of us this weekend will either finalize our plans for the feast, or for the majority of us, we will begin to gear up for the holiday. If you want to be successful at any endeavor you need the right tools. 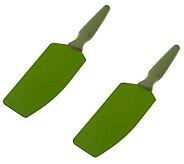 Just like a surgeon has his/her own instruments specially made, a chef relies a lot on his/her prep tools. Sharp knives, quality pots and pans, and all those great gadgets that make the task easier, but add that degree of professionalism. Markdown Mom came across another one of those hot new gadgets and this one comes from Rachael Ray. 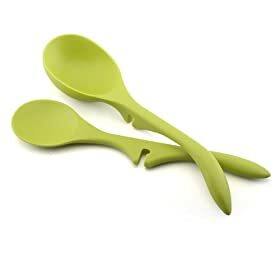 Her silicone lazy spoon and ladle are just perfect for preparing the turkey gravy and so many other dishes. Comes in green, blue, and orange made from silicone that can withstand temperatures to 500° plus they are notched so that they can rest on the rim of your pan. What a handy gadget! At Amazon for $19.95+sh. Guess Which Color Markdown Mom Bought??? For Everything There Is A Season! Sooner or later, every chef or celebrity cook will extol the virtues of cooking with cast iron pans and pots. Around the campfire or in the most sophisticated kitchens, any cook worthy of his/her esteem position whether on t.v. or in the home, will have a set of cast iron cookware. Even some of the priciest name brands are enameled cast iron cookware. For bargain hunters you can find cast iron cookware at auction sites, thrift stores, and tag sales. Even new pieces of cast iron cookware can be found at a reasonable price. The only trouble that you will encounter, whether buying used or new with cast iron, is that it must be seasoned. Oftentimes with older pieces you will find that you have to remove rust from the pan and re-season it. The best pans are those that are in great condition and have been seasoned by many years of wonderful ingredients and food. But what can you do when you get a new cast iron pan or restoring an old one to obtain that wonderful seasoned condition? Well, Cooking Enthusiast® has found a product that not only is labor saving, but relatively inexpensive and is made from all-natural products. 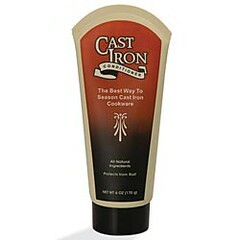 Cast Iron Conditioner recommended by chefs, seasons and protects your cast iron without the tedious oil and heating methods usually used to season cast iron. Just a little dab will do you! For $12.99 for a 6 oz. tube, you’ll save money just in convenience alone and your family will appreciate all those wonderful home cook fast food meals flavored and healthy as only cast iron cookware can provide. Go Forward and Wield That Cast Iron Pan With Confidence!